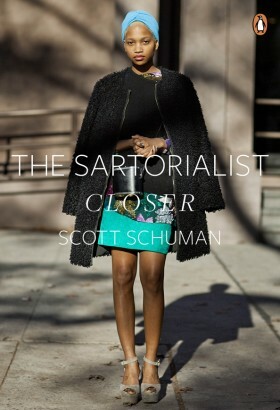 I got the opportunity to interview Scott Schuman, better known as “The Satorialist,” last night. He’s hands-down my favorite street-style fashion blogger, so it was a huge honor to talk with him. He’s doing a book signing at DAAP this Thursday. So, we chatted about the signing, his books and blog, as well as travels, fashion and life in general. Here are the details about the signing…. And below is the transcript of our interview…enjoy and I’ll see you on Thursday! A: First and foremost, tell me about the inspiration behind the book. S: Well, the first book seemed to be doing really well so we decided that it might be a good idea to start another book. It is a different skillset to do the book, you know. The blog can sit by itself and it’s chronological. But, with a book, you have the chance to pair, whether it’s two years apart or three years apart and you can put things together that are either compliments or contrasts. Also, to create something that you can hold is a great option to have. A: Sure, especially if you know a fan of the blog, it’s a great gift idea. I was thinking of all the fashionistas who would love to have it for Christmas. S: Exactly. It makes for a great gift. A: Absolutely. So, tell me about the tour and how you selected some of the cities? S: Well, it kind of just worked. I have been traveling a lot internationally so I thought that it would be fun to do something domestic. I am in Tennessee right now and then Chicago and Cincinnati. I wanted to mix it up a little bit and go to a couple of different places and see if things would fit in. You know, hit a couple of cities, boom boom boom and find some places that would be fun to do a book signing. Hopefully find some good street fashion in Tennessee, Chicago and hopefully Cincinnati. A: Awesome! That’s actually what some of the readers wanted to know. They wondered if you would be doing any street fashion shooting at all while you’re in town doing your signing. S: Yeah, I don’t know how much time I’m going to have. But I will definitely be looking for people at the book signings and maybe I can take a picture of them later. I hope. I do a lot of shots from South Africa and Poland but I would love to be able to mix in some images from Cincinnati, Tennessee and Chicago. A: Yes, for sure. How do you decide on the cities that you travel to? S: There are a couple of different things. It depends on if there are projects, like this, I am doing. I try to schedule myself to do one day a project and then another day of shooting and writing for the blog. It matters and it doesn’t matter, I like to challenge myself. It would be easy to go to Italy or Paris or London. Those places are great, but I like to go places where you don’t have to just point and shoot. You have to find it. It’s the challenge where you have to find things, whether it’s a fashion thing or a cultural thing. It’s always a surprise. A: Yeah, I’m trying to step into your shoes right now, thinking about all the places that you have been. It has to be difficult when you go to all of these cities and you may not speak their particular language. Walk me through that. S: I’m a good actor. I’m a good pantomime. I act out what I want. Cultural issues are larger than language issues. Language issues aren’t always as tricky. Things like who to talk to, who you can touch or if you can talk to women. Culturally, people are worried about how their image is protected and how they are portrayed. That’s usually the hardest cultural issue. You have to be respectful about anyway that you go about it so you don’t create any problems. A: Talking about some of your travels… What have been some of your favorite places to shoot? S: My answer is always that I like to shoot the most interesting person I haven’t met yet. It doesn’t really matter if it is Korea, or anywhere. It’s all about the challenge. A: How is this book new and exciting compared to your first book? S: The way that I shoot has evolved and the way that I blog has evolved. There are images that never made it to the blog that are in the book. Actually one of my favorite images that was shot in Morocco was in the book and never made it to the blog. When you look at image shooting styles, there are different portraits, and new ways the shots are positioned. A: Great! Those were some of my questions and I would love to ask some of the readers’ questions. Do you think that American fashion trends just emulate European fashion trends? Does America offer something distinct or are we just watered down versions of European trends? S: America has its own look. I don’t really pay too much attention to trends but you hear it all the time. There are certain age brackets that have certain looks and tend to follow international trends — 15-20yr olds. When they start to get older, they start to appreciate the uniqueness of where they live and begin to make their own style. They have the ability of seeing things on the internet and they start to pull everything into their own personal look and make it their own, regardless of where the are. They will make their own uniqueness depending on their pride and where they are from. A: The next question talks about the dichotomy of street portraiture, from the $5,000 suits to the other end of the spectrum. Is fashion still the province of the social elite? S: Even though at street level, you will see $5,000 suits but there are also things from American Apparel that are more affordable. Sure, people pay for the mass “prestige” brands, but I feel as though people don’t care as much. That is why I don’t put label names, it’s all about the people and how they feel in their clothes and how they look in their clothes. For me, it’s about the concept of the design. It’s about how you communicate and create desire. It is how clothes help you enhance or hide things about you. On my cover shot, a lot of the girl’s clothing are “hand-me-downs” and they couldn’t have cost more than $100 but she looks magnificent and that is why I shot her. Labels are not a field that I play in. A: Is that a mission of yours? To help people realize fashion is more about style than trends and brands? S: I hope so, and I think they are starting to. There are two people in fashion. There are people that love design, proportion, and texture. Then, there are people who say they love fashion, but they actually just love shopping. There are people that love fashion because it boosts their image and persona through fashion. The people who truly love fashion are who I really admire. They inspire me, and through that, the blog is just a diary of my life. I am not trying to tell people who are stylish and who aren’t stylish. I am just showing what I see and what I like. It may be 50 years down the road, and I think it would just be fun to see the catalog of places and different people I’ve seen. A: When you set out to start this blog, or diary, did you have an inkling of what it might turn into? S: Well, yes and no. I would’ve kept going until I found something. I wanted to find something that was important in fashion. Growing up in Indianapolis, I loved the idea of that world and I wanted to do something important in it. I didn’t know what that was, but I was going to keep going until I found it. I just wanted to do something that I could be proud of. I’ve always known that my goal was to do something to make a name for myself. Going at it with that kind of idea, it really helped get me to where I am. A lot of people want to do a blog but they don’t have the drive, or don’t have something to say. You have to have that vehicle. Mine was to show the fashion world in the way that I do, and then it took off. A: Thus far, what has made you most proud? S: The fact that I have brought people a lot closer to fashion. One of the things that people think about fashion is that it is elitist. It’s something that turned people off. In sports, you can go to the games, wear the jersey. In fashion, you want to wear the clothes. It isn’t easy to go to fashion shows to see your favorite designer — then, if you can’t afford anything designer, it’s hard to interact with it. But now people are much closer to the fashion world. You can take pictures of it and it can be seen and you can share in that experience. So, if I’ve been apart of that, creating their own niche in that world, whether they can afford it or not, it gives them a chance to express it. That is what I am really proud of. A: That is something that I get from your blog. It makes the world a little smaller, you make it a lot more approachable. I also like the posts where it is just a picture, and there isn’t any commentary. It leaves it up for interpretation. Why do you do that? S: A lot of people say, a picture tells a story or a picture is worth a thousand words. I understand why people say that. That image lets people tell their own story with what they see. I like to create my own story of what that image is or who that person is. I don’t write very much because I like when people use their own imagination and make up their own story. It can be interpreted in many different ways. I am really proud of the blog that they can see the image and share their own take on it. A: The world of social media and the conversation that happens online has really changed since you first launched the blog. Even with the integration of the social media and the forums. It’s really enhanced the community and the conversation that happens when you first started the blog… Ok, one more question: what’s one thing everyone needs in their wardrobe? S: For a good wardrobe, you need a good tailor. The clothes that they buy, inexpensive or expensive, need to fit you correctly. It works for every individual person. Thanks to my right-hand-man, Drew Ross, for transcribing this interview so I could post this blog asap! Previous PostCincy Style Bar Opens in Hyde ParkNext PostMiss Em’s Holiday Open House!